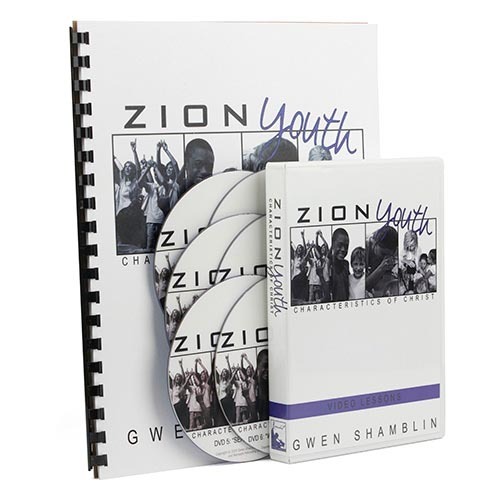 Zion Youth: Characteristics of Christ is a collection of 6 Videos of powerful and clear Biblical teaching that will inspire your school-aged children to find God in everything. In addition, it is full of Godly, fun music and dancing which is just as much fun for the parents as the children! A student guide is included in this set; additional student guides can be purchased for those with more than 1 child in the household. from Brentwood We love this set!!! My children love to watch these DVDs! They listen and learn from the lessons taught by Gwen Shamblin. Then they get up and sing and dance along with all of the great God-focused music. We all come away with a single focus ~ having a True Relationship with the ONE TRUE GOD! !